With 2011 now in the rearview mirror I thought it would be interesting to take a look at the best and worst performing countries in 2011. I discovered that Seeking Alpha has a great list of country ET’F’s by performance over daily, 3 month, 1 year and YTD time periods. It’s a great resource. Below is a list of the top 10 best and worst performing country ETF’s over the past year. 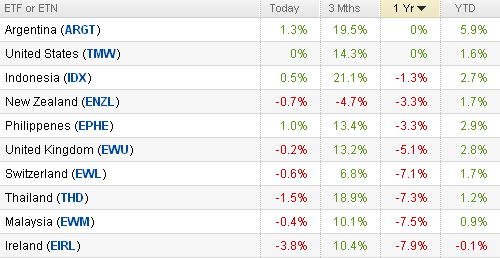 Despite an up and down year that was difficult to trade, the US actually came out on top with .. no gain! 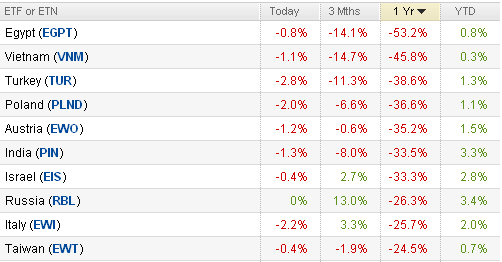 Yes, it was a tough year across world markets with regime changes and debt crises. I personally think it will be another difficult year this year and one that will be tough to trade. Note: The ARGT data doesn’t appear to be accurate for the 1YR data. It may have something to do with the fact it began trading in March, but it began trading at around $15/share and is at $11/share now, so 0% not possible. We are interested in the investment of ETF.